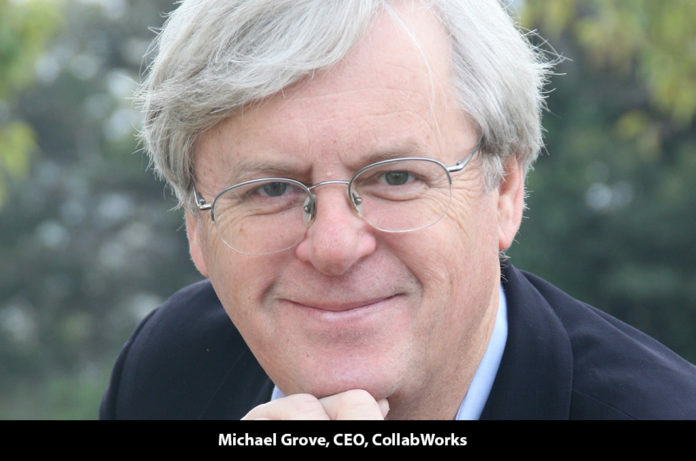 Editor: We had an opportunity to interview the CEO of CollabWorks, Michael Grove, who explained the vision behind his company and what may be a huge breakthrough in the art of corporate management. Mike believes he has found the secret to how to grow a company from a start-up to a billion-dollar corporation without losing the small company’s adaptability and ability to innovate. Kindly walk us through the inception of CollabWorks. A brief introduction to the company. We began our journey with research on how corporations can become nimbler and more virtual. We worked with Cal Berkeley’s Haas School of Business and interviewed 26 corporations including Facebook and Autodesk. The result of this research and over 20 subsequent workshops lead to the fundamental insight that organizations need to optimize around individuals and teams instead of around structure and job roles. We are now aiming to streamline managing and empower the individuals to manage the customers they serve. Our thesis is: the less managing overhead, the more agile and productive you become. We recommend limiting managing to the bare bones essentials. CollabWorks has created a new patent-pending technology that represents a new class of software that we call Digital Management Systems (DMS). We named our DMS product FrameWork. It incorporates management best practices with special focus on improving external and internal customers’ experience, setting measurable objectives and priorities, and continuously adapting to drive increased value creation. The CollabWorks FrameWork application reduces managing time, waste, and misalignment of talent by creating transparent and efficient communication between teams and managers. CollabWorks is now in the early stages of revenue with a fully functional and proven enterprise platform. The company is led by a very experienced team that has previously delivered multiple start-up successes. What are the current trends you observe in today’s landscape that you serve? How is CollabWorks positioned in concurrence with those trends? Overall, competition across most industries is becoming more dynamic and fast-paced. Speed and agility are becoming more important than traditional strengths such as process improvement and control. Companies can no longer afford deep silos and time-consuming synchronization meetings. To speed up decision processes, more needs to be delegated to individuals and teams who directly serve internal and external customers. Jobs or titles do not create business value – people do. Thus, the successful organizations in the future will become more human-centric where the alignments of individuals with corporate goals are what drive increased value creation. What is the pain points you are trying to address in the industry today? Talent is in short supply, yet a significant portion of the existing talent is being underutilized, misaligned, and less than fully engaged. In spite of management training and periodic reorganizations, large organizations continue to operate inefficiently. Typically, the larger the organization, the greater the inefficiencies. What is missing today is a transparent metric for the work produced by worker x for customer y and at value z. The FrameWork includes several metrics that measure quantitatively the value and margin contribution of the all work performed. Thus, the benefits of both small and large improvements across the organization become quantitatively clear and actionable. What differentiates/separates your solutions from the rest of your competition? Why should a potential customer choose you over the others? Our biggest competitor is the status quo. Clarifying work and its quantitative value is new and different. The idea of putting management and improvement processes into software is new and different. We currently have not discovered direct competitors although we are confident that the DMS market will eventually exceed the CRM SaaS market. Is there anything else we have missed to cover or something you would like us to specifically highlight in the article? We believe that the largest business opportunity worldwide today is to encourage innovation from the whole workforce. We essentially have managed the same way for 100 years and it shows as huge losses in value creation. Billions have been spent trying to improve work productivity as well as moral and the results point largely to failure. Engagement scores, turnover, revenue per employee, etc., are not improving. Our view is that organizations need to shift their focus from refining job roles and processes to customer-driven responsiveness empowered by a human-centric organization were the individuals own and manage their direct customers’ experiences. In effect we need to evolve steadily to a more market-driven entrepreneurial model of a fluid start-up like teams where value creation is measured and rewarded by individual performance, not by job title or position.